Legends of Tomorrow 1.11: "The Magnificent Eight"
I’ve been looking forward to this episode for awhile. Not just because I have a soft spot for Westerns either. We finally got to see [that person!] in the DCTVU. I’ll save the spoilers for after the jump, though I’d be surprised if you didn’t know who I was referring to there. After the events in the previous episode where the team making things worse, the team is on the run from the hunters. The team arrives in Salvation in the year 1871, and they all start to feel side effects of the time jump. Apparently, the further in time you travel the worst the side effects are, with a jump that big even Rip is reeling a bit. Oh look, Rip gave the wibbly-wobbly timey-wimey speech about how time isn’t necessarily linear. Time has fragmentations, and they’re now hiding out in a boring one where he thinks the Time Masters won’t look right away. The team doesn’t like the idea of just hiding out though, and they work hard to convince Rip to let them check out the time. Rory steps back onto the team with apparent ease, and says he will keep an eye on the team as they explore the town of Savation. The WaveRider whips them up some era appropriate clothing, and Rip gives the ladies era appropriate protection – namely pistols. While checking out a local watering hole, Kendra bumps into someone and has a vision, likely from her past life, but is unsure of its meaning. Sara and Rory bond a bit over drinks, both attempting to drink the other under the table, and he opens up a bit about his time as Kronos. Stein and Snart head for the poker table, where Stein makes out pretty well. The loser doesn’t take too well to that, and takes it out on the waitress. Stein gets very gentlemanly and tells him to leave her alone. 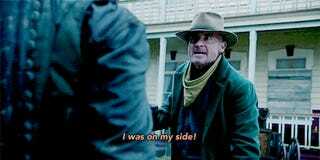 When things start to get heated he pulls a gun on Stein, but Snart takes him out first. A brawl ensues with the others at the bar standing up for their fallen friend, but the Legends team stands their own until someone stops it all. Jonah Hex stops the brawl, and can tell that the team not only isn’t from around her, but not from the time period. Then demands that they take him to see Rip Hunter, which they do. Jonah wants Rip and the teams help with a local problem with a Stillwater Gang. Rip says he doesn’t want to get involved in the time period. Ray Palmer isn’t having any of that though. He says he signed on to be a hero and this town needs one. Jonah Hex takes him to the heriff, who in turn makes Ray the new Sherriff. Or rather, he appointed John Wayne the new sheriff, because that’s the name he has assumed. Kendra is off to find the location in her vision, supposedly she thinks that she can find Carter. Sara isn’t willing to let her run off on her own though, so she agrees to go with her. Stein goes back to the bar and tries to bribe the barman for information on the Stillwater Gang. Here he learns that the man that Snart killed was a member of that gang. There he also meets a distraught woman who claims her son is dying. Then the Stillwater Gang themselves ride into town, guns blazing. The gang rides into town to find Ray refusing to let them just ride into town. He says that whatever arrangement he had before, is over, and they’re not welcome in the town anymore. When the leader of the gang is inclined to fight, Ray isn’t. Instead, Snart shoots the gun out of his hands before he can use it. The gang rides off, and the team counts it as a success. Rip isn’t happy though, because they’re calling too much attention. Jonah Hex isn’t happy either, he says that while it seems like they’re winning, the day will come when they leave and Salvation will be another Calvert. When Rory asks what Calvert is, Rip simply says it’s a close matter and takes Jonah aside. Luckily, the team has access to a supercomputer to look up Calvert even if Rip doesn’t want to tell them. Calvert was a town in Oklahoma in 1868 (three years prior to the current time). “was?” the team asks and the dramatic music plays. Somehow, the ladies found a pair of horses and are heading towards the valley from Kendra’s vision. They both seem to be enjoying themselves a bit. Kendra continues to have visions of the cabin they’re heading towards. Back at the WaveRider, Stein is appropriating some medicine for the boy dying of consumption. Ray and Rip try to talk him out of it, but he stops them knowing what they’re going to say. He says that he had Gideon make up some old fashioned treatment, but it still is decades ahead of its time. Stein shifts the focus then to Rip himself. Stein says that Rip clearly has some emotional attachments to Calvert. Rip figures out that they used Gideon to look it up, and Gideon then displays the pictures of a town that has been destroyed. Rip tells them that Cavert was destroyed by a man named Quentin Turnbull and his posse, but it was his fault. He was on a mission from the Time Masters and grew attached to the era, but forced himself to leave. Turnbull attacked the town the very next day. Even after hearing all that Stein remained unmoved. He still intends on giving the boy the medicine despite Rip saying that they had no way of knowing what the introduction of that medicine could do to the timeline, let alone the saving of the life of that boy. Stein says he can’t risk the feeling of regret of not acting. Jonah arrives and tells Ray that the info Stein got from the barkeep was solid, and they now know where the Stillwater gang is hiding. The two head out, and Jonah was disappointed when Rip turned down the offer to join them. The girls finally make it to the farmstead, and the woman from the bar points a shotgun at them. Kendra then realizes that the woman didn’t know her in a past life. She was her in a past life. They get settled after that with the older Hawkgirl telling Kendra about her life in this time period, including how Savage got Hannibal-Carter’s incarnation in this time. Kendra then realizes that she found a bracelet that they had had in their first life. She wants to find it now, since objects from that time can be used against Savage. Then the older Hawkgirl tells Kendra she is deluding herself, and she can’t fight destiny. They’re born, they find Hannibal or Carter, then Savage kills them, and then they’re reborn again. Seeing that Kendra isn’t persuaded the older Hawkgirl presses on. She says that after Hannibal died, she didn’t want to let Savage kill her so that she could find him in the next. Instead, she tried to find love again in this life, but it didn’t work. She met someone but “fate broke both [their] hearts.” She drives the point home, saying that she remembers their past lives and trying to love others, but it always ends in tragedy or heartbreak if it’s not Carter, and they’re incapable of loving anyone else. Stein uses his medicine on the boy, and it seems to make an improvement right away. He has Sarah Neil, the mother, promise to burn any remaining medicine after the boy is fully cured. Jonah Hex, Ray, Rory, and Snart head out to the location they have for the Stillwater Gang. They’re all ahorse, which gives them a bit of an advantage as they lead an assault on the camp. 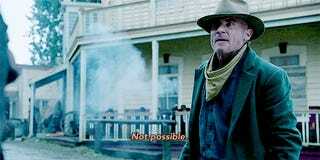 Well, except for Jonah Hex who works better under the power of his own two legs. Ray gets Jeb Stillwater, the boss of the gang, but many others were able to flee. They also manage to take Jefferson in the chaos. The team regroups back at the ship to figure out how to get them back. Stein suggests a straight up trade, Jeb for Jefferson. Jonah Hex says that isn’t going to work, but pistols at high noon will, a duel to which the winner gets his man back. Or the other option is to go in with their future technology and wipe them all out. Rip, obviously, is against this. Then we hear why he was so against leaving the ship, how the draw of heroism in this time period once entranced him. Then Jonah asks him if he would have still left if he knew what Turnbull was going to do. Rip then says that he did know. Rip says that he had to make a choice, and if he had stayed and been a hero in this era he wouldn’t have been able to be a Time Master. Then he says that he isn’t a Time Master anymore, and can choose to be a hero now. He says he will be the one to duel with pistols against Stillwater’s men. Sara finds Kendra brooding, and tells her she doesn’t have to listen to…well, her. She says that just because it went wrong for this version of her, doesn’t mean it will always go wrong. 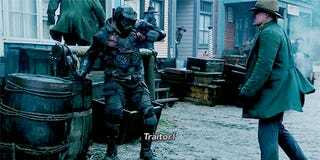 That her didn’t know or love Ray Palmer, but this her does. Rip takes his place at high noon in the streets of the town. One of Stillwaters men faces off against him. The man reaches for his gun and fires, but Rip is faster and shoots him in the chest. They then free Jefferson and carry the man off. The victory is short-lived, however, when they see the hunters approaching. Rip breaks out the future weapons and gives Ray his Atom suit. Stein and Jefferson merge to form Firestorm. Kendra transforms into Hawkgirl. Snart and Rory are without their guns though, as Rip didn’t have the carrying capacity for everything. Rory manages to kill one of them with some blades, but not before he delivers another daunting message. The Time Masters initiated Omega Protocol, which means the Pilgrim is coming for them too. The rest of the team takes down the other two. Rip and Jonah say goodbye, on friendlier terms than they were before. Jonah isn’t sticking around now that that town is safe, and Rip says that they have that in common at least. Snart then asks Rip if he has a memory erasing thing so that the townspeople won’t talk about what happened here. Rip points out that in this case skepticism and disbelief will work just as well. At the tavern the boy that Stein saved thanks him, and we learn that he and his mother don’t share the same last name, he has his fathers, Wells. He’s Herbert Geroge Wells, H.G. Wells. On the WaveRider, Ray asks Kendra what’s up with her, as she’s been distant since her and Sara’s ‘walkabout’. Kendra tells a half truth, that she met a woman who taught her things, and she learned some new info pertaining to the hunt for Savage. On the Bridge the team reconvenes. Rory tells them about Omega Protocol and the Pilgrim being after them. Rip describes the Pilgrim to be the Time Master’s fiercest assassin. Snart points out that they can handle themselves. Rip agrees, which is why she won’t be going after them in the present day, but instead will target their younger selves. I have to say Jonathon Schaech makes a good Jonah Hex. Oh look, Ray gave Bill Gates his nickname, and Stein gave H.G. Wells his pen-name. Although, it was nice seeing that Stein ‘saved’ the timeline instead of messing it up. Which goes back to what Rip said about not knowing what it would do to history if the boy lived. Quentin Turnbull wasn’t a random name, he was an enemy of Jonah’s at one point in his comics, though the circumstances here were different. 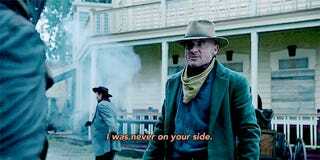 I certainly hope we see Jonah Hex again, in future Western Episodes, or if he joins the team and time travels with them. Still feels weird how quickly Mick Rory rejoined the team, but I loved him this episode, so I can forgive it a bit. They built up the Hunters a bit too much considering how quickly they brought them down.